Almost a full moon in late March, 2013. Why on earth would we return to the same place, year after year? I’ll share with you the reasons, but first a story. Several winters ago while staying at Emerald Lake Lodge near Field, British Columbia, I took a day off downhill skiing to cross-country instead. One can rent skis and boots, as I did, at the little cabin by the bridge. There are two cross-country loops with groomed trails – one around the frozen, snow-covered lake’s perimeter. The other, a second, connecting loop rises above the far end of the lake through the forest toward the towering mountains. A blue sky day – perfect! I laced up the boots, slipped on the skis and headed down the lake at a comfortable pace. Not a soul in sight – it was as if I was the only human for miles. Upon nearing the far end of the lake I looked back to note that another skier was leaving the little cabin and heading in my direction. He too was travelling at a good clip. In fact, he was beginning to gain on me. Not that I’m competitive, but I was enjoying the solitude and did not particularly want anyone, especially perhaps a novice, to catch up with me. I increased my speed and was amazed to note this upstart was already half way down the lake and rapidly gaining on me. I increased my speed as I now entered the second loop, rising into the forest and higher elevation. In spite of my best efforts, he finally caught up and looked like he might want to pass me. After commenting on the beautiful day I remarked on the speed at which he had navigated the lake. We traded skis and of course I apologized profusely. Now, some reasons as to why Jeanne and I return to Emerald Lake, along with one more story. The absolute silence. No traffic. No TV in the cabins. Just being away from the outside world, although in the main lodge, there is wifi. The clean air and pure white snow. Wood-burning fire-places in the rooms and lodge. The hot tub. The wildlife including deer, moose, elk, Bighorn Sheep, ravens, Steller’s jays, and more. All this close to great skiing in the winter and in the summer – hiking, canoeing and fishing. On our third day of our stay last week, arising early, I noted that no water emerged from the tap in our cabin. So with no shave, no shower, and leaving my partner Jeanne sleeping, I arrived at the lodge for morning coffee. I let the front desk lady, Karla, know of the problem. She said she would get maintenance on it immediately. The problem was that the electrical device that kept the water pipes warm had failed and so the line froze overnight. It had reached 21 C below during the night. After breakfast we checked on the status of the problem which was still being worked on and were offered a room change upgrade. At first we declined, but then realized it might be best to move cabins. Being in sales for most of my career and understanding the real value of customer service, we got to experience this first hand. This included help moving our gear over to a cabin right on the lake, a beautiful cheese and fruit plate and complimentary breakfast the next morning. And a very nicely hand-written note apologizing for the inconvenience. Jeanne and I will certainly be back to this special place. 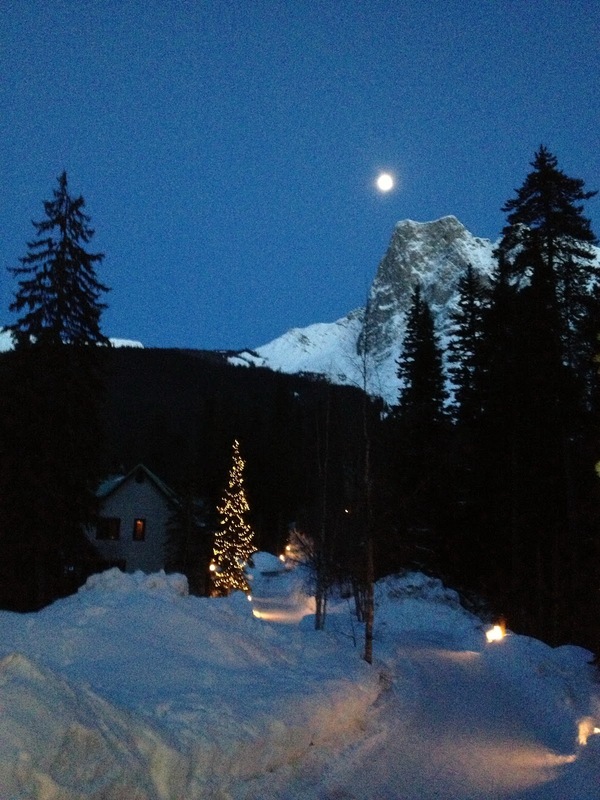 We have just returned from two more weeks stay at Emerald Lake Lodge enjoying the Spring skiing – our 14th year ! It was terrific !